Over the past week I have been at a Oil Refinery and Oil Products Storage Terminal Fire Safety Conclave in New Delhi, sponsored by Indian Oil Company. 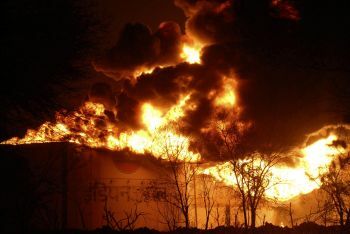 One of the drivers of the conclave was the explosion and fire at Indian Oil’s Jaipur Terminal. Attending this conference gave me a lot of time to reflect at the causes, mechanisms, and consequences of large spills of gasoline. After this reflection, I think that traditional risk analysis techniques might be under-reporting the risk posed by gasoline spills because of a fundamental assumption about the progression from spill to explosion may be fundamentally incorrect. Traditional risk analysis techniques discount the probability of a vapor cloud explosion as the result of a gasoline spill because the cloud size is expected to be relatively small and relatively quickly dissipated by wind and atmospheric instability. The analysis is usually undertaken as follows. A spill rate is calculated, and then is either determined or assumed to filled the diked area around the tank. An amount of vapor generation is calculated the reflects the rate at which material evaporates off the surface of the pool. This evaporation rate is the used as an input to a dispersion model that determines the extents of the vapor cloud beyond which the flammable materials dissipate below the lower flammability limit concentration. If a source of ignition is present, the cloud will burn in what is typically expected to be a flash fire, which will subsequently ignite the pool resulting in a pool fire. Typically, the possibility of a vapor cloud explosion is discounted. Storage tank farms are typically unconfined and relatively unobstructed. As a result, there is not enough turbulence generating obstacles to increase the flame speed to a point where significant overpressure (and thus a significant shock wave) is generated. These conclusions are based on numerous studies where unconfined vapor clouds are generated in test environments where obstruction blockage ratios of up to 30-40 percent do not generate dangerous overpressure levels. These experiments were typically performed using hydrocarbons such as methane and propane. An excellent summary of this data is presented in a document published by the UK Health and Safety Executive (HSE) entitled, Offshore Technology Report – OTO 92 002 – Offshore Gas Detector Siting Criterion Investigation of Detector Spacing. The fundamental problem with discounting the explosion potential of a gasoline spill is that it may not actually be analogous to the tests that resulted in the conclusion that dangerous over pressures are not expected to be obtained. Upon reflection and review of the incidents I believe that traditional techniques might under-report the size of the extents of the flammable cloud that is created and the propensity of that cloud to explode instead of simply burning in a nearly laminar fashion (resulting in negligible overpressure. Even more fundamentally, the consequences of ignited gasoline spills are typically greater than would be predicted by standard quantitative chemical release consequence analysis techniques. Consider three recent high-profile gasoline spills in fuels storage terminals: Buncefield – in the United Kingdom, Jaipur Terminal – in India, and Carribean Petroleum Refining – in Puerto Rico in the USA. All three of these incidents resulted in the vapor cloud explosions that traditional modeling techniques would have dismissed as not credible. Video of the explosive overpressure effects of the Buncefield explosion can be seen in the following video. Based on the previous video, it is quite clear that the Buncefield explosion did indeed result in significant overpressure and explosive effects. Similar explosive effects are evident at the Caribbean Oil Refining incident, as seen in the following video. Granted, the explosions in the video are after the fire was fully developed and are not the result of the initial gas cloud explosion, but a detailed analysis of the incident being performed by the Chemical Safety Board indicates that vapor cloud explosions occurred (More information here). In addition, the Indian Oil Jaipur incident, can seen in this video. Based on all of the previous information, it should be clear that vapor cloud explosions are a credible outcome of gasoline storage tank overfills. The question that needs to be researched and answered is why current risk analysis techniques discount them. I believe that the answer may lie in what is being modeled versus what is actually occurring. My hypothesis is that we are modeling and analyzing vapor clouds when we should be modeling and analyzing aerosol clouds. Another view of the Buncefield Gas Cloud formation is shown in this video. What is curious about this video is the appearance of the cloud. What we are seeing here is not a traditional vapor cloud. A true vapor cloud, meaning the the hydrocarbon that has evaporated from the pool is in the gaseous state, would be transparent. Since we are seeing a white opaque fog, the physical phenomenon is different from what is being modeled. A visible opaque fog is not caused by a gas, which would normally be transparent. A fog is technically an aerosol, which is a colloid where finely divided drops of liquid are suspended in a continuous phase of a gas. If we are indeed seeing an aerosol cloud, the dispersion and explosion modeling will take on an entirely different character. Since the cloud is not simply a gas, it will cling together differently then a traditional vapor cloud, potentially resulting in much larger cloud sizes than dispersion modeling predicts. This is the result of the finely divided droplets being able to continue to evaporate and generate more vapor inside the cloud as it travels. Also, the amount of energy contained in the cloud is significantly higher than a pure vapor cloud since the finely divided droplets will contain much more mass of hydrocarbon than a our vapor. It is also try reasonable to assume that aerosol clouds could have been developed. Since gasoline is stored near its flash point, if material were released at even a slightly elevated temperature above atmospheric, one would expect pool evaporated hydrocarbon to condense back into droplets as the material is cooled in the ambient air. In order to firmly establish the causes of this recent rash of gasoline storage facility explosions, industry needs to perform more research. It is my opinion that research into the generation of aerosol clouds from these releases, along with the dispersion and explosion effects of the aerosol clouds will be critical in understanding the explosion mechanisms of these events.